This family-friendly event will once again bring barbeque cook teams from all over the United States to Sevierville to compete for $15,000 in cash and prizes and the title of Tennessee State Champion in the Bush's Best TN State Championship Cook Off. Rounding out the event is toe-tapping bluegrass music, incredible arts and crafts, kids' games and the Mountain Soul Vocal Competition honoring Sevierville's favorite hometown girl, Dolly Parton. Friday night (May 18), take a little time to visit with the barbeque cook teams you've seen on cable channels like the Food Network as you stroll through the "Que Zone." Then make sure you bring a lawn chair for the free bluegrass concerts with rising stars and legends of the bluegrass genre (past headliners have included Ricky Skaggs, Marty Stuart, Del McCoury and more). Saturday morning (May 19), start the day early and watch as championship cook teams turn in their competition meats. Then stay for the announcement of winners at 4pm. During the competition the teams will cook an estimated 2,832 pounds of meat including 20 pounds of pulled pork, 24 pounds of brisket, 5 pounds of chicken and 10 pounds of ribs each. Winning teams will receive recognition in Chicken, Ribs, Pork and Brisket as well as specialty categories like "Anything Bush Beans", "Anything Wampler's Farm Sausage", Sauce and Dessert. 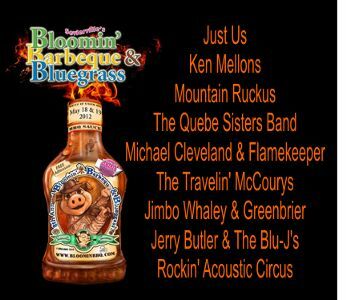 An expanded Kids' Zone and the Bluegrass Music Tent, sponsored in part by The Music Outlet, add fun and enrichment for the kids and families who attend Bloomin' Barbeque & Bluegrass. The Kids' Zone includes attractions like climbing walls, bounce houses and old-time toys while the Bluegrass Music Tent gives kids (and kids at heart) the chance to touch and play bluegrass instruments such as banjos, fiddles and more (don't worry, instructors will be on site to help). Both of these attractions will be open until 9pm each day of the event. A highlight of Bloomin' Barbeque & Bluegrass is the 8th Annual Mountain Soul Vocal Competition Finals held on May 19. Finalists from around the nation will sing their hearts out for a chance to win prize money, a recording session in Nashville, Tennessee and a guitar autographed by Dolly Parton. This competition, the only one of its kind that festival organizers know of, honors the songwriting of Dolly Parton. Competitors, male and female, must sing a song written by Dolly Parton (there are over 3,000) and do so in their own style (rock, rap, country, bluegrass, swing, soul, etc.). Bloomin' BBQ & Bluegrass is proud to present the Hard Rock Cafe Community Stage, an exciting live music venue where you can hear up-and-coming performers of all musical genres. In addition, meet fun characters – like Sevierville's iconic Dolly statue and more as you enjoy the event. Bloomin' BBQ & Bluegrass weekend will also feature a play about Sevierville's history called "Heartstrings" performed by the Sevierville Intermediate School Drama Club. Finally, there will be plenty of interactive opportunities to win prizes, connect with your favorite bands and more.